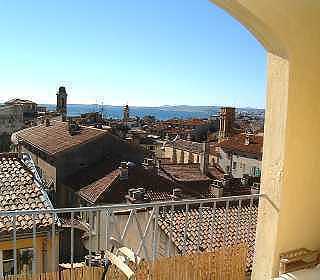 In the heart of Vieux Nice, overlooking the Old Town stands this unique property development offering breathtaking views plus shops, restaurants, and transport on your doorstep. La Providence is a collection of small scale apartment blocks (with lifts) built to blend with the surrounding provencal style architecture. We love it and have been living there off and on since 2001. The location is brilliant, being secluded yet near everything. 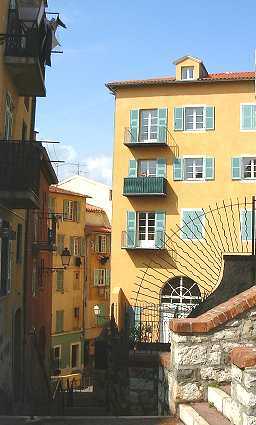 It's quiet, there are no busy roads nearby and you can walk to the Chateau Hill Park, Cours Saleya, the Promenade des Anglais or the flower market through the charming cobbled streets of Vieux Nice. Local shops and market stalls line the streets beneath the back stairs which lead to the old town. The antique shops and port of Nice are 5 minutes walk to the east and the beach is just 10 minutes walk through the old town to the south. The front driveway leads down to Place Garibaldi which was given a massive make over as part of the Nice tram installation and returned to its rightful place as the coolest square in Nice. Over a dozen cafes, bars and restaurants now grace the arcades, including the fresh fish restaurants and stalls around Cafe Turin. Monoprix is there too, as is the new arts museum and theatre complex. 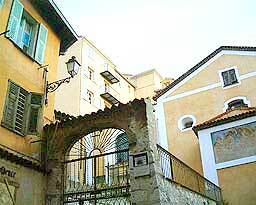 A walk around Nice takes you from the middle ages to 21st century Eco via gorgeous well preserved art deco. It’s the most walkable city I have ever encountered with markets, fresh food, bars, a port with fishing boats, city life all just 30 minutes from the convenient airport. There is no need to hire a car since public transport is excellent and as you are so close to the tram and buses or trains you can easily get to Monaco, Cannes, St Paul de Vence, etc. Buses throughout the Alpes Maritimes from Menton in the east to Mandelieu in the West cost just 1.5€ euro including one transfer and if you buy a multi trajet of 10 tickets it's just 1€ a ride. The 98 lignes d’azur bus to and from the Nice airport now stops right at the bottom of our drive on Catherine Seguranes. It costs just 6€ and is a great ride along the seaside.